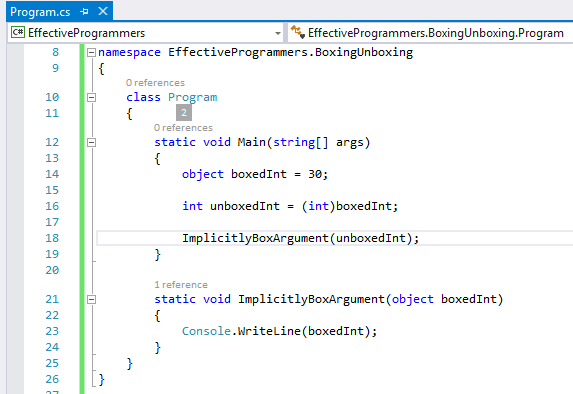 While writing code we generally don’t pay much attention to boxing & unboxing. It does matter in performance. And a highly skilled and experienced C# / .NET developer must pay attention to everything that can improve performance. In relation to simple assignments, boxing and unboxing are computationally expensive processes. When a value type is boxed, a new object must be allocated and constructed. To a lesser degree, the cast required for unboxing is also expensive computationally. Use ToString method of numeric data types such as int, double, float etc. If you define your own value type then override implementation of basic object methods. Use generic List<>, Dictionary<> (et al) instead of ArrList & HashTable. Here is my another post about Effectively use StringBuilder to improve performance while concatenating strings which is related to similar performance topic.